Elephants teach the alphabet on the Toddler rugs! They say that elephants never forget, and neither will your students after they spend a little time looking over the Toddler Rugs. Our artists have integrated twenty-six elephants onto this amazing colorful rug. Each elephant carries a sachet that has an upper and lower case letter. Your students will learn the alphabet by interacting with each other. Moreover, two clowns carry balloons in the middle of the rug. 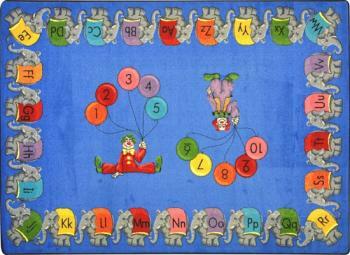 Each clown holds five balloons that combine to list numbers from one to ten. Children love a circus parade. Teachers love a teaching tool that engages the entire class. Learning is just one half of the benefits of ordering the Toddler Rugs. We have designed this rug with SoftFlex®, which is an air-texturized, polypropylene, secondary back that is the latest advancement in area rug backing systems. Our rugged rugs can withstand the most rambunctious children. The tightly woven fibers eliminate wrinkles and insulate children from extremely hot classroom floors. Just glue down the Toddler rugs for easy installation. We treat the Toddler Rugs with anti-stain and anti-soil compounds that make it easy to wipe clean juice box spills and mud tracked in from the playground.